Irish Superbike champion Charles Stuart. The Irish short circuit season engages gear on Saturday with the traditional Easter weekend Enkalon Trophy meeting at Bishopscourt in Co Down, which will host the first round of the revamped Ulster Superbike Championship. Organised by the Motor Cycle Road Racing Club of Ireland (MCRRCI), an 18-race card has been put together, with practice due to get underway from 9am. The Enkalon Trophy meeting is being held for the 41st time and will go to the overall winner of both Superbike races. Following the recent announcement by the Enkalon Club to end its long and loyal involvement in the sport, the MCRRCI will become the trustees of the prestigious Enkalon Trophy. A spokesman said: “After a long partnership the Enkalon Club have disbanded due to fundraising for events becoming a huge struggle. Leading the entries are reigning Irish Superbike champion Charles Stuart, plus Alistair Kirk, Gerard Kinghan, Luke Johnston, Marty Lennon and Aaron Armstrong. Fans will also be treated to a blast from the past, with George Farlow coming out of retirement to compete at the event. Former winner David Haire, who clinched the trophy for the first time in 2014, is also making a comeback. The Lisburn rider has spent two years away from the sport and has been employed as a full-time teacher in Finland. However, Haire has been tempted back with the aim of winning the new-look Ulster Superbike Championship and will ride a BMW S1000RR Superstock machine, with backing coming from James Chignell, director of Rope Access Works Ltd.
Haire, who also intends to compete at the North West 200 in May, said: “Looking at the exciting Ulster Superbike series as well as the news about the development of a race circuit near Coalisland, this has made others become more involved in the new championship, and with the encouraging help and work from the MCUI – along with the various motorcycle clubs – it can only be a positive. “As for myself, my home is now in Finland with my girlfriend Francine. However, I am racing to show my support for local racing and the new championship, as well as family and friends – even if it’s only for this season. A huge entry of 230 riders are entered for the annual Bishopscourt season opener, featuring competitors from Scotland, England and the Czech Republic. 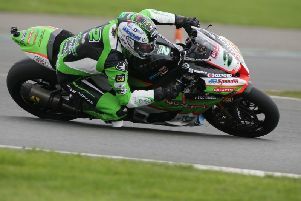 The Supersport class rarely fails to disappoint and last year’s champion Jason Lynn will be aiming to start the domestic season on a winning note. Lynn’s opposition includes Korie and Kia McGreevy, Mark Conlin and Christian Elkin. The Classic machines will be in action in the 250cc, 350cc and 500cc categories, while the young hopefuls of tomorrow will line-up in the Young Guns and Junior Cup races, which will run concurrently. The schedule also includes Supertwins, Production Twins, Moto3, Pre Injection and Lightweight Supersport and the Cup races. Racing is expected to commence at around 11am. Admission is £10, with children under the age of 12 admitted free.